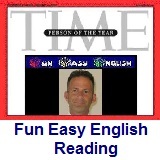 ﻿ Fun Easy English - reading practice and learning about the holiday Christmas Eve. Christmas Eve is the evening or entire day before Christmas Day, the widely celebrated annual holiday. It occurs on December 24 in the Western Christian Church, and is considered one of the most culturally significant celebrations in Christendom and the Western world, where it is widely observed as a full or partial holiday in anticipation of Christmas Day. One reason celebrations occur on Christmas Eve is that the traditional Christian liturgical day starts at sunset, an inheritance from Jewish tradition. This practice is based on the story of Creation in the Book of Genesis: "And there was evening, and there was morning – the first day." This structure for the liturgical day is followed for all feast days throughout the year in the Eastern rite and is retained for Christmas (as well as for Sundays and other major festivals) in the West, where the liturgical day ordinarily begins at midnight. Many churches still ring their church bells and hold prayers in the evening before holidays; for example, the Nordic Lutheran churches. In some languages, such as the Scandinavian, Christmas Eve is simply referred to as "Christmas Evening". Since Christian tradition holds that Jesus was born at night (based in Luke 2:6-8), Midnight Mass is celebrated on Christmas Eve, traditionally at midnight, in commemoration of his birth. The idea of Jesus being born at night is reflected in the fact that Christmas Eve is referred to as "Heilige Nacht" ("Holy Night") in German, "Nochebuena" ("the Good Night") in Spanish and similarly in other expressions of Christmas spirituality, such as the song "Silent Night, Holy Night". This holiday is actually not as celebrated as the following Christmas Day but still considered to be an important Christian holiday. 1. What is Christmas Eve? 2. Why do celebrations occur on Christmas Eve? 3. The traditional Christian liturgical day is an inheritance from which of the following? 4. The story of creation is in which of the following? 5. Many churches still ring their church bells and do which of the following in the evening before holidays?